Unique personalized gifts for husband, wife, boyfriend, girlfriend, father, mother, parents, son for a birthday or anniversary. 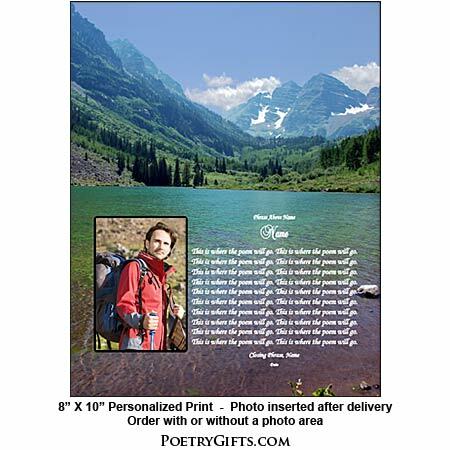 Although our poems are already written, occasionally our customers would like their own poem designed in order to create an even more unique personalized gift. 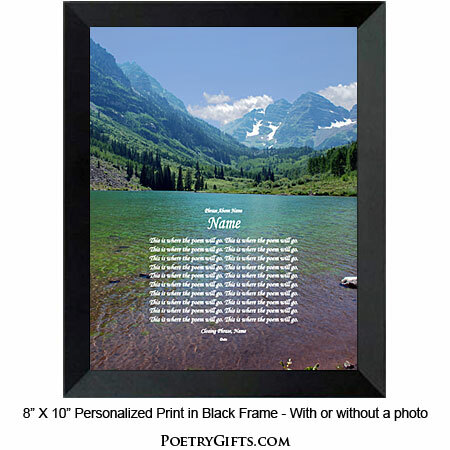 Do you have a poem that you would like designed in this beautiful mountain scene? It doesn't have to rhyme... just your thoughts and feelings for someone you care about. Your verse will receive special handling by an experienced graphic artist who will lay out the poem in this design. The Design Your Own Poem option is also a wonderful way to have a verse designed that is in a language other than English. 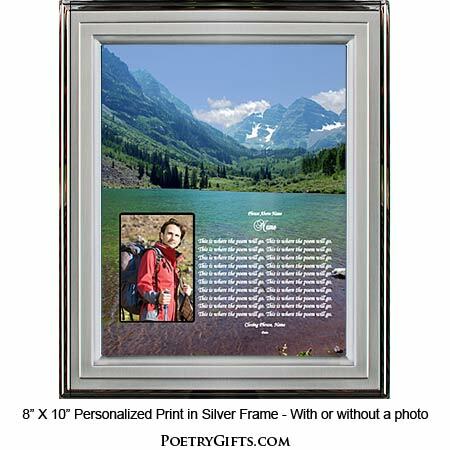 Your poetry along with our original photography and a cut-out opening for a favorite photo is a winning combination. It's a perfect keepsake for family members and friends. 3. Closing Phrase and Your Name(s) (as seen after poem) - Examples: Love Always & Forever, Mary; Love Always, Jim; I Love You, Celine; With Love, Aunt Cindy; Congratulations, The Miller Family; God Bless You, Grandma; etc." Please look at the above design in order to determine a suitable poem length. We suggest your poem is no longer than 16 lines with no more than 16 words in each line. There are no set guidelines; this is just a suggestion. If your poem is much longer than the length we are suggesting, the font/type will need to be made smaller to accommodate your entire poem. On the order form, please make sure to type an email address that you check often and phone number in case the designer needs to reach you with any questions. Unless you have permission from the author or poet, please only submit non-copyrighted works. I wasn't sure what would become of my poem or how attractive the presentation might be. I am so pleased. The words are arranged exactly as I'd like, the background is clear and bright, font choice is perfect. Well worth the price, this gift will make a nice memory that defines my heart. Definitely will do this again! Didn't know what to expect but ordered a gift for a friend. It exceeded my expectations. Quality was fantastic, and they did a wonderful job putting it into a beautiful format.